With iOS 6, Apple will be releasing an updated set of web apps on iCloud.com, including Mail, Calendar, Notes, Reminders and Find My iPhone. Find My iPhone is a useful feature that allows you to track or wipe your iPhone, iPad or iPod Touch should it get lost or stolen. 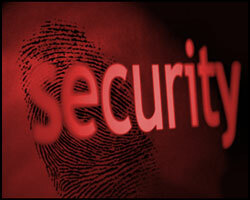 For more info check out my article on Protecting and Recovering Your iPhone and iPad from Loss and Theft. 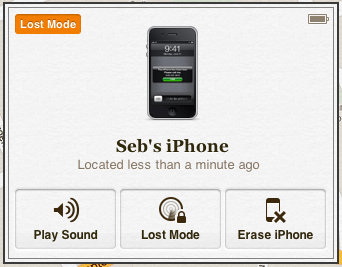 In this post I just want to point out the changes to Find My iPhone, in particular the new “Lost Mode”. The new user interface is largely similar to the old one, with a couple of minor improvements to the device box which is now in the top right corner. I’ve circled two of the new elements in red, the first one on the left is used for status information (in this case stating that this is an old location), and on the right side showing the charge/battery level of the device. At the bottom of the box are the same Play Sound and Erase iPhone (Remote Wipe), and the new Lost Most which replaces the Remote Lock and “Play Sound or Send Message” buttons from the previous Find My iPhone. Clicking on the Lost Mode button brings up the first step (above) which allows you to enter an optional phone number where you can be reached. This number will be displayed on your device’s screen, and can be called. Clicking next brings up the following step (below), where you can enter a message that will be shown on the screen of your device (together with the phone number if you entered one). Once you click Done, if your phone is online it will be put into Lost Mode (see below). This will automatically lock the device (using the current passcode), and display your message and phone number. You will receive an email to inform you that your device has been put into Lost Mode, and if your device is located, you will see it in Find My iPhone and receive an email. The screenshot below is what your iPhone’s screen would look like in Lost Mode. If you click on Lost Mode again, you have the option of changing the phone number and the message, as well as choosing whether to receive email updates. 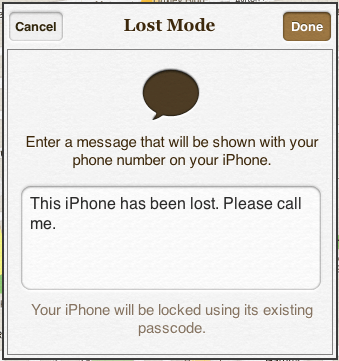 If you find your phone, you can stop Lost Mode here too (or just enter the passcode on your phone). In Lost Mode, the dropped pins that indicate the phone’s location are persistent, meaning that every time the phone’s location is refreshed, a new pin appears (instead of moving the old one). This allows you to track where your lost (or stolen) device is going throughout the day. All in all this feels like a decent improvement to Find My iPhone, as it definitely simplifies the process of tracking and recovering a lost device. For those of you hoping to play around with the new iCloud updates before iOS 6 is released, check out beta.icloud.com. 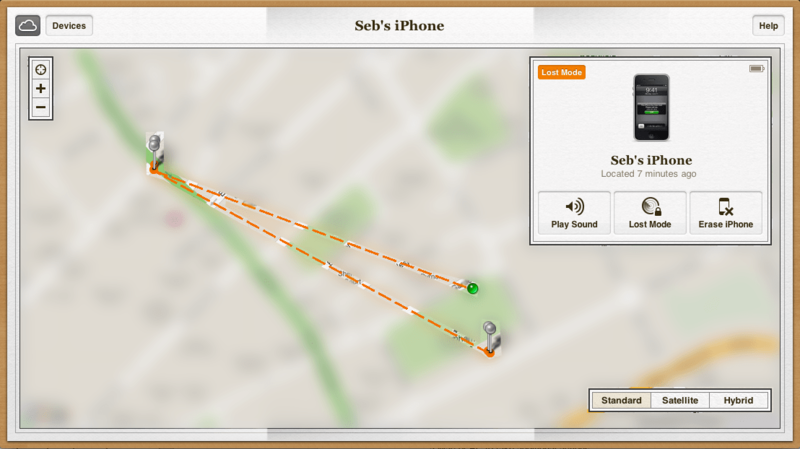 You can also read my Frequently Asked Questions About Find My iPhone (and iPad). The new updates are cool but they don’t really deter a thief. The goal should be made to make thrives feel like stealing an iPhone is worthless. The best way to do that would be to not allow the phone to be powered off once in lost mode. The alert feature should go on for at least 5 minutes putting the phone in a state where it is completely frozen. The other option would be to have software that allows you remote access to turn your phone on if tos powered off. I don’t think these features are hard to do but I’m not a programer. A question is it POSIBLE TO TRACK IPAD BY SERIAL NUMBER ??? I BOX AND EVERYTHING…..
Hi Randy, that’s explained in the article. 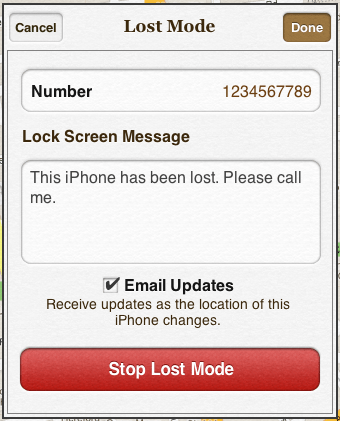 If a device is in Lost Mode, just click on Lost Mode again in iCloud and then press the ‘Stop Lost Mode’ button. I have had two iPads stolen the space of a few months. Apple do not care too much about the issue, except they feel sorry for me. 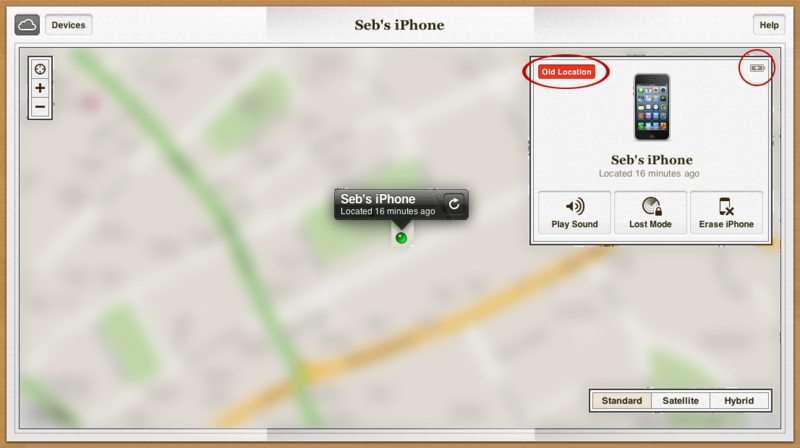 The Find My IPhone feature is useless. They can bypass security features and just not register the device. However, once back to factory defaults, they can use the device as if their own. It is a sad indictment of apple not to be able to track a user via a serial number when it accesses the App Store. As users of iTunes we do not have any choice. Our right to decide if we use or not Itunes to purchase from apple is taken. (other options are not legal). WE as ITUNES USERS should have the right to track the device using ITUNES. Apple has our names and devices serial codes. FOR WINDOWS AND ADOBE products YOU ARE allowed to REGISTER AND UN-REGISTER your serial code and product. Why WE, as ITUNES users, do NOT have that choice? If they wipe the memory clean and start using it as their own device. Will it still show up in my list of devices or will it disappear. I am not sure if it is stolen or lost. I put it in locked mode but it just shows it is offline but that might be because it has died. I have spoken with Apple reps at length as well as the Police. It would appear that even if you could locate the device, the Police (at least here in Australia) are not allowed to execute a warrant. Apple have stated they have no such capability to remotely wipe or disable IPads and the like. This is just nonsense. At the end of the day, Apple profits from the theft of their devices, because people normally go back to re-purchase an Apple product (via insurance claims or not). It’s a sad indictment on Apple that they inadvertently reward theft though their relaxed approach toward security. The ACCC here in Australia instruct consumers to hit up Apple for compensation – you can imagine how well that approach pans out. Apple, as a corporate entity, are mainly interested in pushing bottom line and not necessarily looking after the consumers who have had their EXPENSIVE devices stolen and reset – even though the device is registered (like a credit card) to a designated user. There are no winning when battling Apple on this issue. They simply don’t have any motivation. My devices still show up as registered to me. So if there are any thieves on this forum, trying to find out if they can wipe a device, then yes is your answer: and nobody will be none-the-wiser. My iPhone 5 was stolen today. I tracked it to the exact address through Find My iPhone and called the police, who appeared there within 15 minutes, as they are aware of this service and now had an active lead to follow. Using my wife’s phone, we then sent a text to my phone informing the thief to look outside on his front street and watch the police arrive and that he had ten minutes to ‘do the right thing’. He went out the back door and dropped it in a mailbox; we found it by playing the locator sound from my computer. So anyone who say this is useless is wrong. Apple ROCKS! I am using iPhone 4, I am not able to see anything other than zoomIn, ZoomOut, Standard, Satellite, Hybrid options. Is this lost mode facility not there for iPhone 4??? @Suresh: You have to click on your device, and the panel should appear with the three options you see in the screenshot in this post. I used ICloud to track my phone down today. I had left it somewhere at work…on a big site. I set the message to appear on the screen so that someone finding it could contact me. However, when it was found the message was hidden behind the lock screen so nobody could read it. Surely this shouldn’t happen? What can I do to avoid this if it happens again…which I dearly hope it doesn’t! @Jay: That doesn’t sound normal. For me the message always appeared on the lock screen. You might want to try testing it again. My IPhone 4S was stolen yesterday and I tracked it through the app however the circle around the location pinned is probably a five mile radius. It tracks it to woods behind some houses which I have tried to walk through and use the sound player option but no success. I involved the police and they were great and went to about 7 or 8 of the houses and no success. I am not sure why the app can’t narrow the accuracy of where it is. No insurance. Ugh! On another note, a homeless man picked up my husband’s phone a few months back. we were able to find him and the phone a few miles away at a park filled with homeless people. we walked around and played the sound until we were able to pinpoint the guy passed out. another homeless guy reached into his pocket and pulled out the phone still making the sound. Definitely feels good when you are able to solve a case b/c of a handy feature. Wish i was as lucky this time around. Sounds like you just need to get some support with restoring it. There is no reason why it shouldn’t work. If you can’t get support on Apple’s community forums, take it in to an Apple store, or call Apple’s telephone support which you should still be covered by if your iPad is less than one year old. I lost my ipad4 three weeks ago and it appears on my sons ipad that they change the name and it appears with lock icon . What does it mean? My 5s was collected in gun point, they asked of my lock 4 digit, never asked of my icloud password. I also quickly rushed home to change my icloud password and yahoo password, since then have been putting it on lost mode. which way forward. My step-daughter has an iPhone that I track. Could I put it in LOST MODE from my phone app? Would she be able to remove the Lost Mode with her pin, or would I need to use my pin from my phone? This would be a neat thing for parents. Please advise. Apple should come out with such a mechanism by which the i phone’s location should get mailed to E-Mail ID or SMS to alternate phone number, duly providing provision for the same. Alternatively, it should give rise to Alarm sound at the maximum pitch so that any other person who listens can catch the offender. The phone once put in Lost Mode should get frozen with the message flashing the number to which message is to be sent. Those who steal should be made to feel through out life for such an heinous act. Apple should design the mechanism in such a way. Will Apple come out with such changes? My ex boyfriend stole my phone last night when he was arrested. I tried to retrieve it before hand but he would not give it back. I tried to track it but it is off. I did however put it in lost mode but unfortunately when he bails out and is able to turn the phone on he knows my passcode to get into it. Is there ANYWAY when it’s turned on that I can change that without having the phone on me? Is there any way to retrieve videos if you were recording but accidentally pressed the lock button ? Or is this still not available ? My 90 yr old WWII Veteran father-in-law – just lost his phone. It’s his favourite toy… like the kids – he is always on it.. FB text and phoning. He was very upset about losing it. I just googled this site to see what this new feature would do when it wasn’t showing me where it was. Said it was offline. Following this screen’s steps, I sent the screen message which pinged to get someone’s attention. Gave the message to call me, which they did. is there a way to play like actual sound from the phone like what is going on around it on the device you are tracking it from. I want to be able to listen to what is being said.